Baked Nile perch is easy enough for novice fish cooks to master and tasty enough for novice fish eaters to enjoy. Just count to three for a delicious and healthy main dish. One, rub mayonnaise on the fish. Two, sprinkle spices on the fish. Three, bake. Sometimes it is surprisingly simple to prepare great food. This baked halibut dish works well as a fish appetizer for a holiday dinner (gefilte fish substitute) or as a summer Shabbat dinner main dish, when the meal tends to be late and is best-kept lite. Fish-eating vegetarians guests will be thrilled. 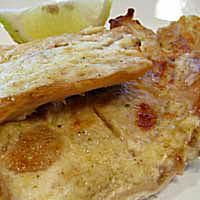 Other white fish, such as cod or tilapia, can be used in this recipe instead of halibut. For a moist and flavorful salmon entree, simply drip seasonings on the fish, wrap the fillet tightly in foil, and bake. This baked salmon fillet is easy to make, healthy and light to eat, and aesthetic enough to serve to guests. We were introduced to this recipe for salmon steak in Asian sauce, and what a fantastic meal it is. This fish dish is delicious, festive, and fairly simple and quick to prepare. For a healthy dinner, serve this fish with brown rice and salad. Naomi Muller's batter-fried fish is easy to make and delicious. While frying isn't optimal, the recipe compensates in the health arena by using whole wheat or whole-spelt flour. Muller also provides a wheat-free alternative that uses brown rice flour and oat flour. Why work hard when you don't have to? You can enjoy great tasting gefilte fish without spending all day in the kitchen. Simply buy a frozen gefilte fish loaf, cover with tomato sauce, and bake. Baked gefilte fish in tomato sauce is an easy and delicious Shabbos appetizer.